CALBAYOG CITY – Department of Public Works and Highways completed the construction of road projects all in barangays Amampacang, Dinagan, Mabini and Catabunan, Calbayog City, Samar amounting to P100M under the local infra-program of the district. This road stretches 8.796 kilometers with drainage structure of 1,415 linear meters. 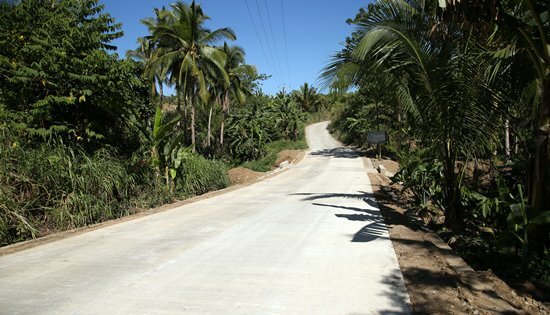 This P100 million project by DPWH Samar First District Engineering Office to construct the roads traversing four barangays opened up a lot of opportunities for about 4,520 farmers, businessmen, motorists and residents of not only the said barangays but other areas near them for either trading or bartering of crops. They can now transport their crops, copra and other products to the marketplace much faster and easier because travel time becomes shorter and the road is now better. This project is essential because transportation is a challenge to farmers and residents of the barangays since the roads then are not yet developed and not concrete. Farmers and residents trying to deliver their products to the city have to go through the rivers using boats as their means of transportation to get it in the city’s marketplace. This is a conscious effort of DPWH Samar First District Engineering Office to provide ways on how to make life easier as well as to connect every area in the city to ensure that basic services and necessities can be accessed by people situated in far-flung areas. Interconnectivity is vital in a nation’s development.